While I had the airbrush and paint booth fired up this evening to do some priming and initial paint work on a different project I’ve been working on this weekend (more on that sometime later when I’ve made some more progress) I also ran about a dozen of these hoppers through the paint shop to paint the interiors. I picked up at least part of the technique (with regards to some of the colours and order of use) from an old RMC magazine article, although probably any time anyone ever does something, they always put their own slight twist on it. My first step is to paint the interior with a light primer colour. For some cars in raw grey this was not always necessary, but as I have several cars molded in several different colours including red, yellow, green and gray (most were stripped from various roadnames) and a primed interior is required to let the actual colours cover properly. Once primed, I gave the interior a base coat of Model Master “Steel” to give it the metallic silvery of bare polished steel. Then – working very lightly, and progressively up the sides of the interior – blend in Gunmetal, Rail Brown and Rust. Go real easy on the gunmetal and rail brown – the gunmetal is a dark almost black colour, and the rail brown just helps blend with the rust and shouldn’t be too prominent – and the whole interior can get a really light final mist of rust to blend all together. The one really tricky bit about these interiors is the angled pipe bracing. You really have to be careful to mist the colours in from both sides around the braces to avoid “paint shadow” where the brace blocks the spray. (I did end up with a couple cars with a slightly noticeable vertical line at some of the braces. 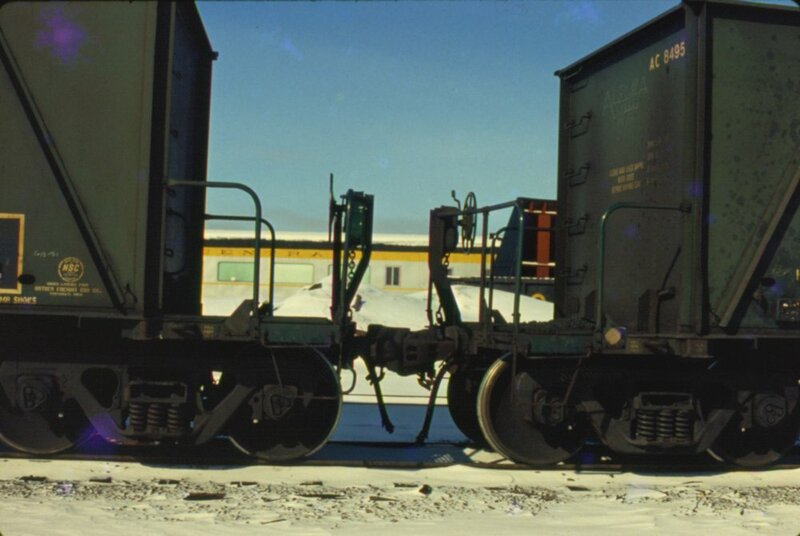 I may go over some of these interiors later again, after the cars are fully painted and lettered, with some powders and pan pastels to add a bit of additional colour for specific loads that these cars carried around Michipicoten and Wawa – limestone, coke, sinter and raw ores, but otherwise this is the basic colouring for the car interiors. The top of the car will later be masked off completely to paint the exterior body of the car. 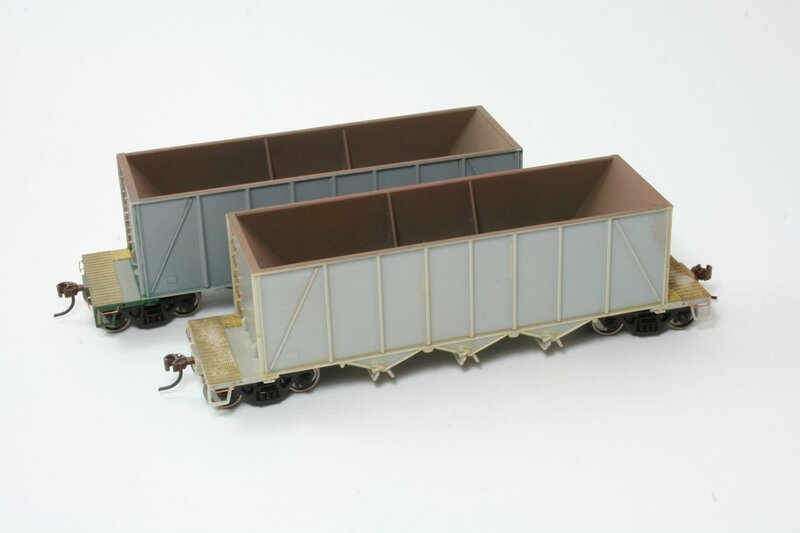 This post is mainly just included for completeness for the hopper series, as the details are basically just assembled according to the kit instructions, although as Walthers doesn’t really sell cars with modeler-applied parts anymore, I should perhaps note a couple of things. 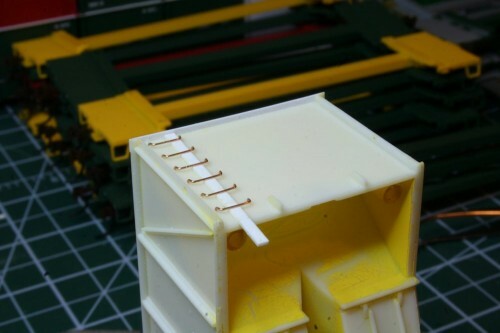 If you’re adventurous you could also replace the flat thick kit pieces with styrene channel to better represent the prototype parts in finer detail, replace the tail end bits of the door bracing with additional bits of styrene strip, fabricate the extra loop for the door lock on the appropriate bars. I did not do this. 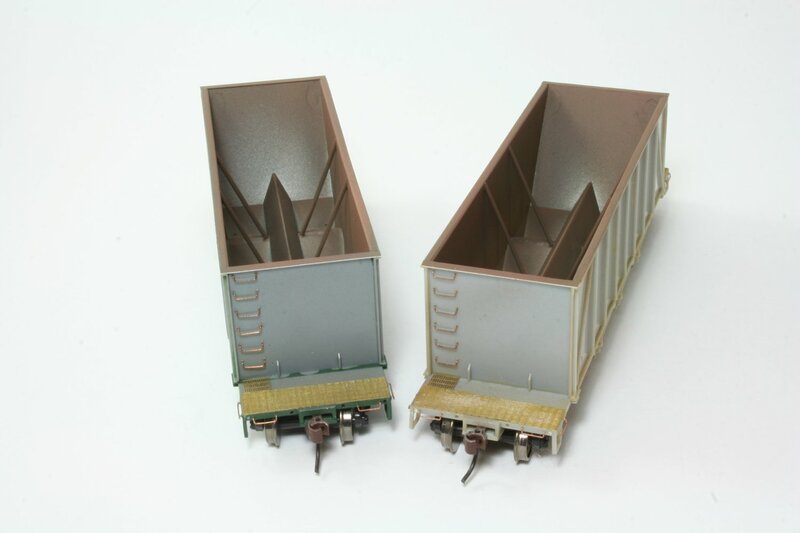 If you get some of the latest Platinum Line releases from Walthers, any of their cars without additional detail parts for air-actuated doors (i.e. a big air tank mounted on the car end) have omitted the spring details. And unfortunately, since the detail parts are not add-on pieces on an included parts sprue, the springs are just not included in the box. Apparently Walthers thinks that only the cars with air-actuated equipment has these door springs, which is entirely false. Sadly there’s not likely too much that can be said there, and since they don’t stock additional parts (I tried and failed to get replacements from them, and they seemed not to consider the missing parts a mistake) I will likely be saving a couple of parts sprues to make a mold and copy-cast in resin the needed parts for about 2 dozen such cars missing the springs. Over the last few weeks I’ve been slowly working on this hopper project again, drilling out the myriad holes for the car body grab irons. This project languished for a while as I didn’t have any #80 drill bits (darn things are so easy to break!) so I had to order a few, and I’ve just been pretty busy through the last couple of months with the December holiday season and other things. However a week or two after New Year’s I got my order of fresh drill bits, and I’m trying to deliberately spend a little time at least one or two nights a week on projects. Of course the primary project I’ve started to get back into is my 25 car batch of hoppers where each step of progress takes a bit of time due to the volume of cars being worked on at the same time. And drilling out that many small holes on 25 bodies and frames has taken a few weeks to complete. So that has accounted for my dearth of recent updates. However I am trying to get some momentum going again, and hopefully get some other smaller projects finished off as well. 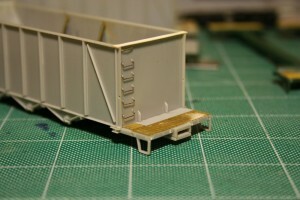 So, without further ado, back to the hopper project! Over the years this model has moved between different product lines at Walthers: first their standard line, then “Gold Line” with metal wheels, then “Platinum Line” which have wire grab irons factory installed. (And I think with the latest release(s) the model has been shifted again into the “Proto” series (the old Proto 2000 line inherited from Life-Like), although I really don’t think this model belongs in that category.) 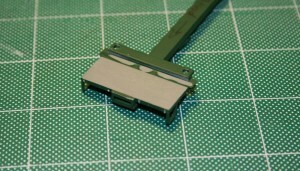 Earlier releases before the models were upgraded to the “Platinum” line did not have grab irons installed. I’ve been collecting these cars for quite a while now (and grabbing cheaper pre-“Platinum” cars at shows and on eBay to build up the fleet) so I have a lot of both. A bit of comparison of prototype photos to the model reveals a couple of interesting minor details. First, the prototype AC cars have an additional grab mounted off the top cap on the end (which of course the model does not have, and which I discussed in an earlier post). 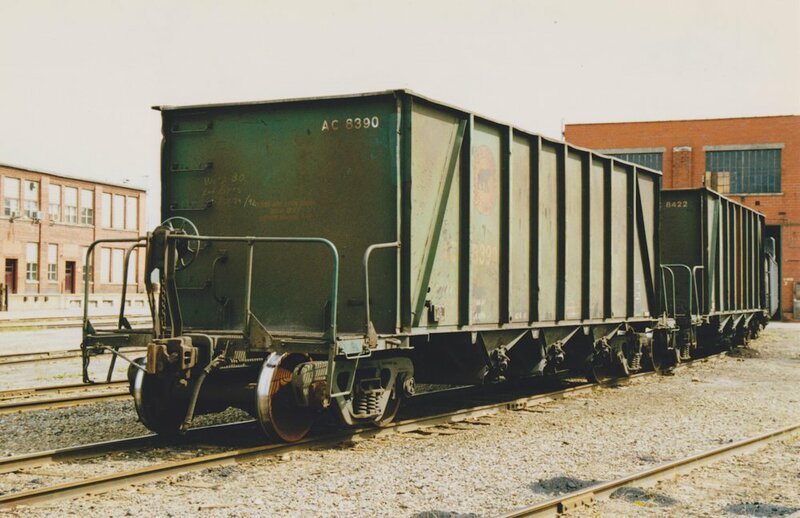 AC 8390 end view. At Steelton shops, August 1997. Blair Smith photo. AC 8495 end details. March 1981. Photographer unknown, Chris vanderHeide collection. 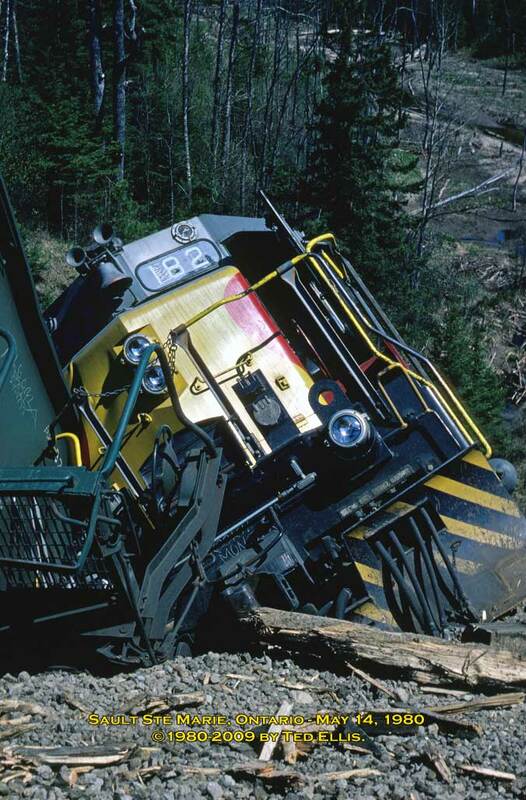 Notice that the 8300 series car at top has a total of 5 end grabs plus the vertical grab mounted to the top chord, with the topmost end grab being almost directly below the vertical one, giving a doubled effect near the top of the car. The 8400 series car has 4 end grabs, without the grab nearest the top of the car. 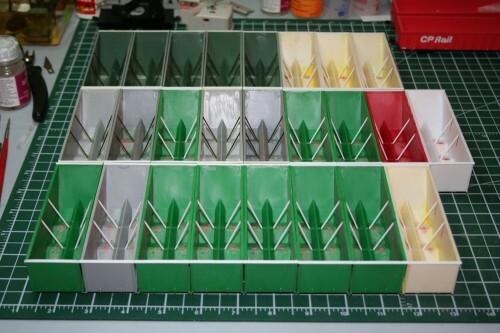 Compared to the model, the model is actually molded with locations for 6 grab irons. With the amount of cars I am working on, I decided it was not worth the amount of effort it would take to competely remove all of the molded bolt detail and the pre-molded drilling dimples and trying to make a template to re-drill it all to have 5 evenly spaced grabs instead of 6. 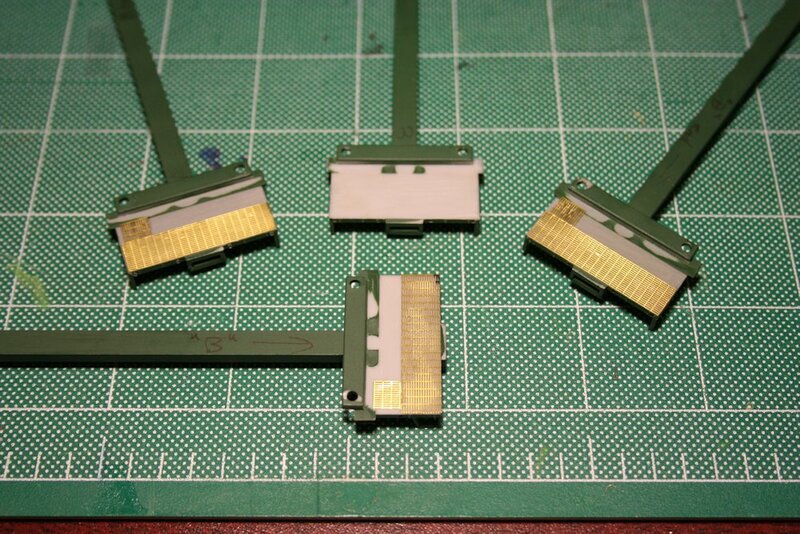 (For the 8200/8300 series cars, or 4 (without the top one) for the 8400 series cars.) However, removing the detail for the top grab would provide that different visual detail between these two batches of cars. With the extra rung of the model, the spacing doesn’t quite work out perfectly, but the effect is close enough. For the 8400 series cars, I simply carefully carved away the bolt/drilling dimple detail for the top grab from the surface of the body and wet sanded the area with fine (1000-2000 grit) automotive finishing sandpaper. The remaining dimples are all drilled out with a tiny #80 drill bit in a pin vise. Using styrene spacer to install end grab irons. 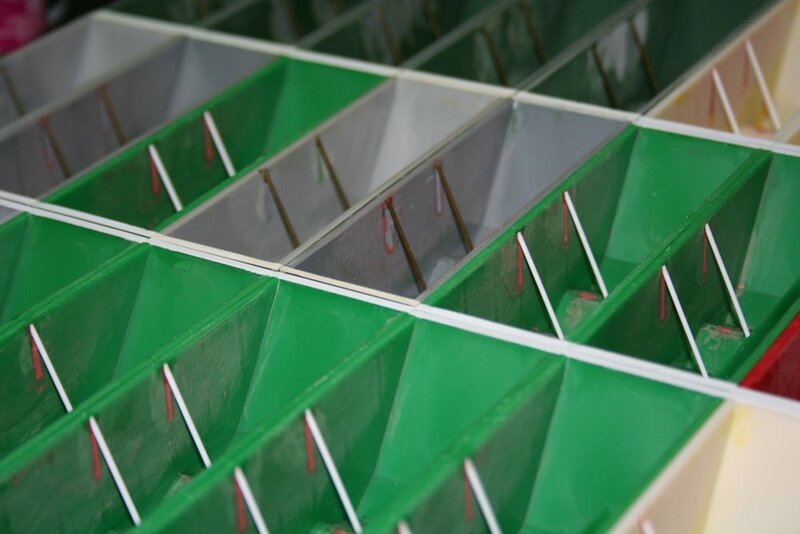 When installing the grabs, cut the tails to length before installing; the open space inside the car end will be filled with the large metal weight that comes with the car, so these can’t extend into the interior. 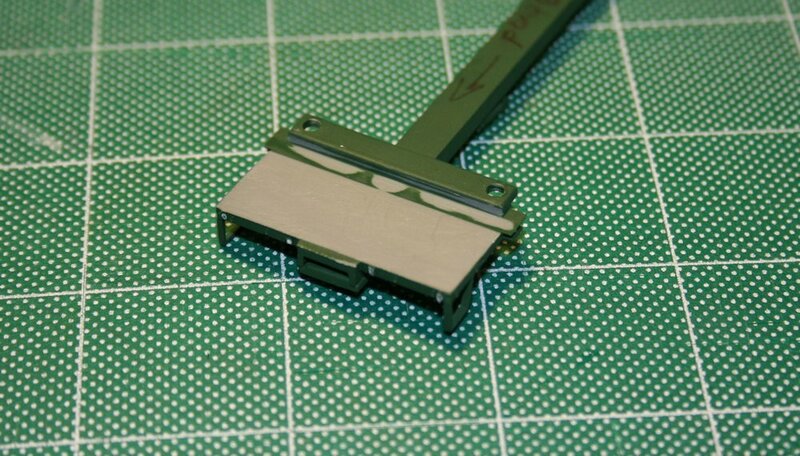 I trim the tails shorter before installation with a pair of flush cutters, and once installed and the glue is dried, finish off the interior with a few swipes of a flat needle file so the weight will sit properly into the cavity. By comparison, the top grab is a straight 18″ grab. I used my calipers to line up the locations of the drill holes for the top grab with the end ladder and drilled them out as close to the edge of the strip as possible. 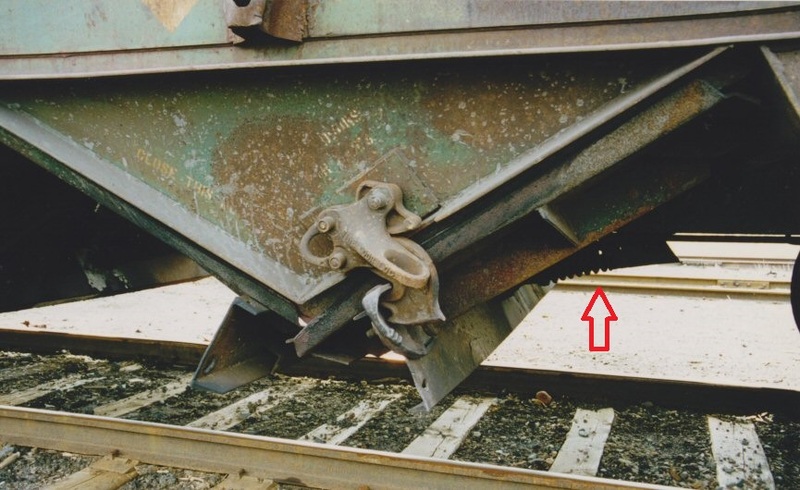 This offsets the grab from the end and lines it up vertically with the end grabs. The grab is inserted (without trimming the tails in this case) from the bottom using tweezers and CAed in place, using my same .030″ spacer to obtain an even level on the grab. Once the CA sets, I cut the tails off with my flush cutters and file the ends of the wire flush with the top of the cap strip. Finished grab irons. 8201-8400 series (left) and 8401-8500 series (right) versions. I’ve also been working on drilling and installing the grab irons on the end platforms of the car underframes. Nothing fancy here, just drill out the provided dimples and install the grab irons. Finished end and platform grabs. All of the drilling was completed first; I’m working my way through installing the grab irons and that part is still in progress on the majority of the cars. About half a dozen of the bodies are complete so far. You might note in the backgrounds of the photos above that the deck grating on a large number of the frames still also needs to be completed yet, so it will still take a while to get all 25 cars completely up to this point, though I may progress some cars to the next point even while still catching up with some of the others. This completes the major visible body detailing. 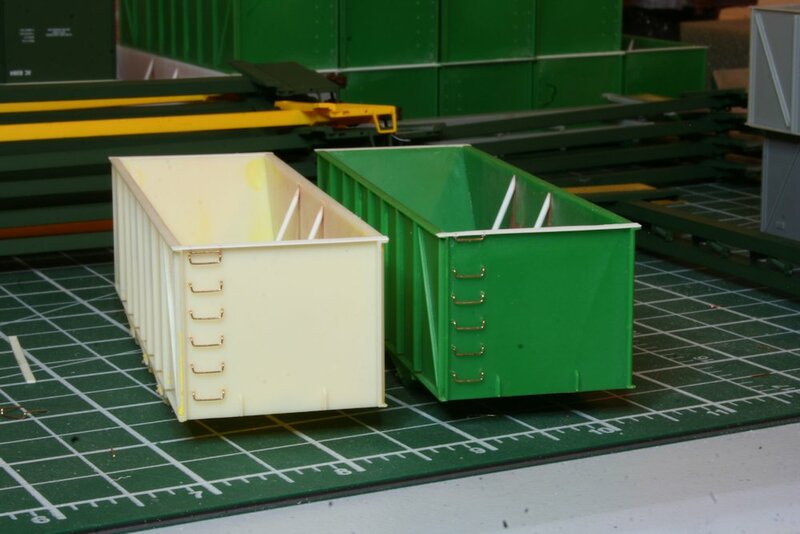 The next major assemblies to figure out will be the altered end handrails for these cars, and the underframe detailing, which will be more or less installed as intended by the original kit and which should complete the assembly of these cars. These twenty-five cars now have the interior bracing and the treatment to the top chord completed. I explain the modifications a bit more in this previous post, but the process basically involves patching the holes on the inside of the body (where the solid bulkhead part from the stock model was fitted) with body putty, adding the extended lip over the end of the car, filing the top of the sides smooth, instead of the peaked side on the model representing an angle iron for stiffening, and finally installing the new interior bracing. 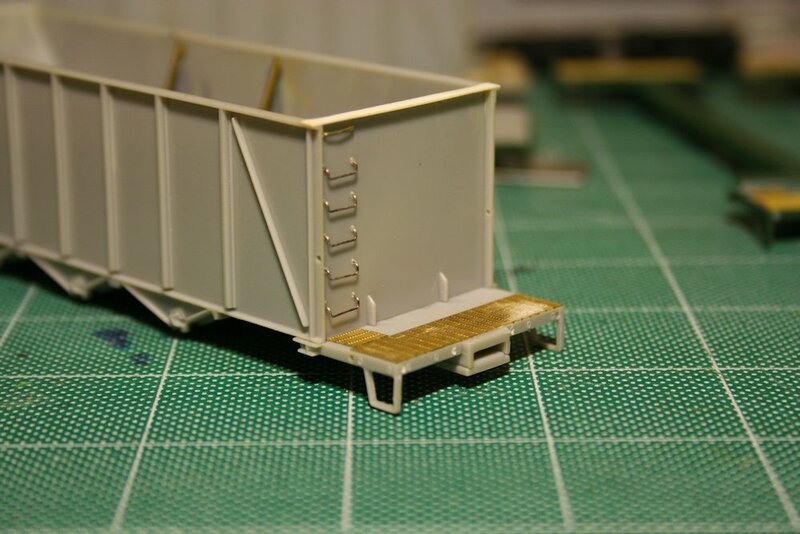 On the older cars I did, I fashioned the bracing from .040″ brass wire, but I’ve now taken to using 3/64″ (.047″) styrene rod from Evergreen to make these, as it’s far easier to file and work with, and the welded styrene-styrene bond is stronger and more flexible than the brittle CA bond to glue the brass to the plastic body. 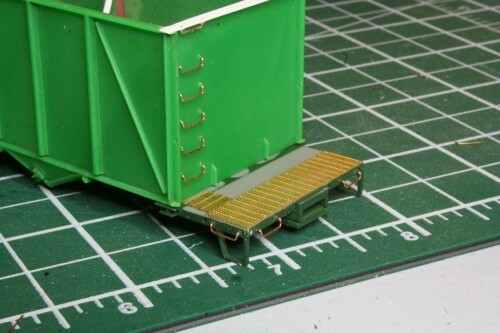 While the stock Walthers model basically just has some generic raised-tread pattern on the end, you can see that the pattern of walkway grating is quite distinctive, and I wanted to capture this. If I were only doing one of these cars, I might consider completely cutting away the end platforms and rebuilding them from scratch to have the open grating, however for the sheer volume of these cars that I need, I’ve decided this would be far too much time and effort to be worth it. I do however wish to at least replicate the tread pattern, which is a big difference from the model. To this end, after disassembling the cars and removing the handrail pieces, I filed the top surface of the end platforms smooth to remove the existing tread texture. I cut the new walkways out of etched brass walkway/grating material. The walkways are a rectangular “Apex” tread pattern. I’ve been using etched brass material from Details Associates. I just used a regular pair of scissors to cut the thin brass sheet. There’s two parts to the walkway tread on these cars. There’s the grating on the open area of the platform, and an extra bit of grating leading to the end ladder. The platform grating is cut out of the etched material in a rectangle 2.5 by 10.75 scale feet in size. The cut piece should all be whole rectangles, with the “grain” following the width of the car. The walkway to the end ladder grabs is oriented perpendicular to the platform grating. With the sizing of the rectangles in the Details Associates etching, I cut a strip from the etched sheet 3 rectangles wide; this is perfectly the size to fit between the platform grating and the car body. I then cut these into approx. 1.75 scale foot pieces. With all the piece cut, I attached them to the prepared underframe pieces using CA adhesive. Very carefully, trying not to glue my fingers to themselves or the car, I used a toothpick to spread the CA across the bottom surface of the grating, and then applied the grating material to the car. For the smaller pieces I used a pair of curved tweezers to move them into position. Several finished platforms, with one just filed smooth in the middle. 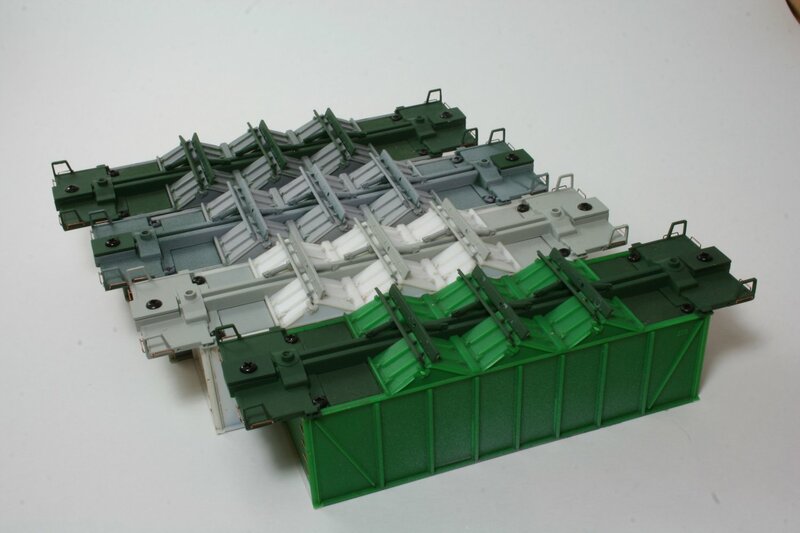 Completed walkway/platform grating with the underframe and body fitted together, showing how the walkway accesses the end ladder. This is the current point I’m at with these cars (well, the 9 I’m [semi-]actively working on). 5 cars now have the grating complete (I just finished a few of them up tonight) and another 4 have the platforms filed and prepared (and actually have for quite some time now). After I finish this current batch of cars, (I’m hoping to try to bring these 9 all the way through to completion now) I’ve got another 50 or so of these Walthers cars waiting for the same treatment at some point!